Geared with angle adjustor, the hot selling P3.91 indoor LED screen cabinet is able to set up in various ways as you wish, such as flat, curve, convex, concave, circular, etc. It is currently one of the most cost effective solutions for stage and rental applications. The best price above is based on one cabinet size of 500mm x 500mm, and it is NOT included with control system such as Linsn, Novastar, Colorlight, Dbstar, etc. 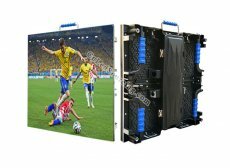 If you want lighter panel--3.5KG/piece, please go to http://www.cnledsourcing.com/magnetic-p391-indoor-led-video-wall-for-rentals-p-464.html. - Excellent heat dissipation and low power consumption.